My WordPress analytics for 2011 showed that this post received more hits than any other of my posts last year, so I decided it was time for a follow up! Let’s start with a basic Google search here. What an incredible number of styles and wording there are around! I still think that this game is a great ice breaker and gives the kids something to do at a wedding. It would also make a great activity for those big special occasion parties – you know the ones: wedding anniversaries, special age parties, etc. Just change the words around or write your own rhyme (I’m absolutely no good at that!) and you’re good to go. 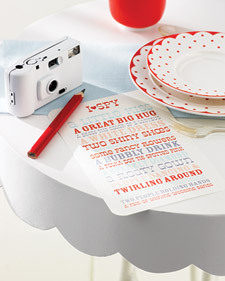 As a special thank you for taking the time to read my post I’ve decided to give away a printable I Spy. I found this rhyme on an image in the Google search, but unfortunately I am unable to find the original source so if these are your words please let me know so that I can credit you properly! To get your free download file please click here (updated … you will be taken to the Freebies page of www.justjanedesigns.com to download these files). We’ve had such lovely weather over the last week or so that I have been overcome by the need to give something back to the world!! I have just completed a printable Thank You card which I am offering to all my readers free. Download your copy of the file here. Your download is in the form of a PDF file consisting of 4 pages. The first page contains the card front and extra images for decoupage or whatever you wish to do with them. The next two pages contain a variety of insert sheets and extra embellishments. The final page contains instructions on how to put the card together and also gives advice on paper types, etc. Hope you like it. Feel free to leave a comment with your feedback. Free printable card download ! Well, here it is! Last week I promised you a new section to my Galleries and today I’m launching it. And to celebrate I’m also making the download FREE – whoo hooo!!! Hurry on over to the new Printables page in my Galleries and you can try out the Butterfly Tag card for yourself. I’d also love to hear how you get on with it and, as always, I’m open to suggestions for themes for invitations. I’ve been searching for ways to make an exciting Pirate party invitation for little boys … and, it has to be said, inspiration has been sadly lacking! However, with a little application and a lot of frustration I came up with these two, both of which I’m quite happy with. One is double sided but features a fun map & fanciful wording and the other is more ‘run of the mill’. I’m always on the look out for theme suggestions so please feel free to post a comment on any of my blog posts. What theme are you planning for your child’s next birthday party? Set me a challenge and if I take you up on it I’ll let you have a PDF file of the finished design to print yourself or to take to your local printer. Yes, that’s right, a freebie!